Netflix's 'American Vandal' Cast Gathers at Hollywood Premiere! 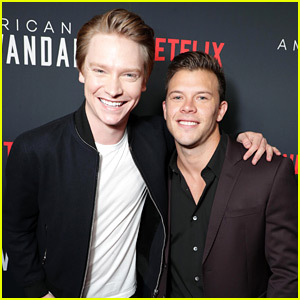 Calum Worthy and Jimmy Tatro pose for a photo on the red carpet at the American Vandal special screening premiere event on Thursday (September 14) at the ArcLight in Hollywood. The guys were joined at the event by their co-stars Tyler Alvarez, Griffin Gluck, Camille Hyde, Jessica Juarez, Lou Wilson, Camille Ramsey, G Hannelius, Gabriela Fresquez, Lukas Gage, and more. American Vandal is a half-hour true-crime satire that explores the aftermath of a costly high school prank that left twenty-seven faculty cars vandalized with phallic images. Over the course of the eight-episode season, an aspiring sophomore documentarian investigates the controversial and potentially unjust expulsion of troubled senior (and known d–k-drawer) Dylan Maxwell. Not unlike its now iconic true-crime predecessors, the addictive American Vandal will leave one question on everyone’s minds until the very end: Who drew the d–ks? You can now stream the full first season American Vandal on Netflix! Idina Menzel stops to pose before her performance at the 2016 Carousel Of Hope Ball held at The Beverly Hilton Hotel on Saturday evening (October 8) in Beverly Hills, Calif. The Tony Award winner was joined by Denzel Washington, Jamie Foxx, Samuel L. Jackson, Alan Thicke, Clive Davis, Allison Holker, Francesca Capaldi, G. Hannelius, Garcelle Beauvais, Jane Fonda, Jillian Rose Reed, Kathy Griffin, Lea Thompson, Lindsay Arnold, Melanie Griffith, Regina King, Kym Johnson, Sharon Stone, Vivica A. Fox, Yara Shahidi, David Foster, and Jay Leno. The Carousel of Hope is held every two years and has raised over $75 million dollars towards finding a cure for diabetes. FYI: Idina is wearing a Mathieu Mirano gown. Holland Roden & Arden Cho Are Alice + Olivia Show Beauties! Holland Roden and Arden Cho stop to pose as they attend the Alice + Olivia by Stacey Bendet & Neiman Marcus Present See-Now-Buy-Now Runway Show at NeueHouse Los Angeles on Wednesday (April 13) in Hollywood. The Teen Wolf ladies were joined in the front row by Katherine McNamara, Jennette McCurdy, G Hannelius, Kelli Berglund, Skyler Samuels, Sarah Bolger, Niki Koss, Laura Vandervoort, and Whitney Port. Earlier in the week, Arden posted a video explaining why she’s not returning to Teen Wolf. Friendly Exes Mandy Moore & Wilmer Valderrama Reunite at Halloween Horror Nights! Friendly exes Mandy Moore and Wilmer Valderrama met up at Halloween Horror Nights at Universal Studios Hollywood over the weekend with tons of other celebs in attendance as well! 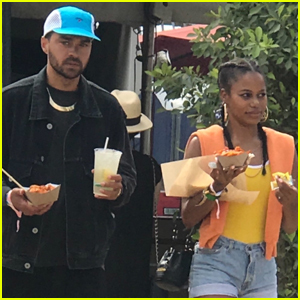 Also in attendance at the event were Christina Milian, Karrueche Tran, Girl Meets World‘s Rowan Blanchard, Jessie‘s Skai Jackson, Kendrick Lamar, Meghan Tranior, Castle‘s Nathan Fillion, Fifth Harmony‘s Camila Cabello, singer Alexander Deleon, model Josephine Skriver, comedian Chris Hardwick, Jaime King, Lydia Hearst, actress Zelda Williams, Ashley Madekwe, Jesse Metcalfe, Cara Santana, Supernatural‘s Jake Abel, Michelle Trachtenberg, Baby Daddy‘s Tahj Mowry, young star G Hannelius, Zendaya, D.J. Cotrona, Modern Family‘s Sarah Hyland, and Clipped‘s Ryan Pinkston with girlfriend Ciara Robinson. “Also, I’ve know this goof (aka @wilmervalderrama) since I was 15! And @rp1313 has been my bff for nearly 12 years…. So many indelible memories and stories with these 2. Always fun to catch up with an #HHN run. �’�🎃🎃🎃🎃�’�” Mandy captioned a photo on her Instagram of her, Wilmer, and her pal Raina Penchansky. Nina Dobrev & Zendaya Hit Up Taylor Swift's L.A. Concert! Nina Dobrev and Zendaya strike a pose while hanging out at Hyde Staples Center hosted by Tommy Bahama during the Taylor Swift concert on Saturday evening (August 22) in Los Angeles. The ladies were joined by Modern Family‘s Ariel Winter, Bunk’d star Peyton List, Dog With a Blog‘s G Hannelius, and Dancing With the Stars pros Cheryl Burke and Mark Ballas. In case you missed it, check out all the pics and videos of the special guests Taylor had on stage that night! FYI: Nina is carrying a kate spade new york bag. Insidious: Chapter 3's Stefanie Scott Premieres Her New Movie! Stefanie Scott makes her red carpet entrance at the premiere of her new movie, Insidious: Chapter 3, on Thursday (June 4) at the TCL Chinese Theatre in Hollywood. The 18-year-old actress stars in the new film, which is a prequel to the first two movies in the horror franchise. Make sure to check out our full portrait session and interview with her! Also stepping out at the event were Stefanie‘s Jem and the Holograms co-star Hayley Kiyoko, singer Becky G, Unfriended‘s Renee Olstead, model Lydia Hearst, YouTube brothers Austin and Aaron Rhodes, as well as young stars Olivia Holt, Taylor Spreitler, G Hannelius, and China Anne McClain. Go see Insidious: Chapter 3 in theaters right now! FYI: Stefanie is wearing a Vivienne Westwood dress, Christian Louboutin shoes, an Edie Parker clutch, and Meredith Marks jewelry.